Prism Johnson Limited (Formerly Prism Cement Limited) is professionally managed Company promoted by the Rajan Raheja Group. Prism Johnson Limited (Formerly Prism Cement Limited) is India's largest integrated Building Materials Company with a wide range from cement, ready-mixed concrete, tiles & bath products. The Company has three Divisions, viz. Cement, H & R Johnson (India), and RMC (India). 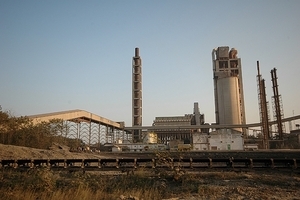 The Cement Division of the Company operates one of the largest single kiln cement plants in the country at Satna, Madhya Pradesh. The Division also has a packing unit at Allahabad, Uttar Pradesh. Equipped with machinery and technical support from world leaders, F. L. Smidth & Co. A/S, Denmark, Prism Cement has created a niche for itself in the cement industry. Prism Cement primarily caters to the demand in the Northern Region, mainly in the States of Uttar Pradesh, Bihar and Madhya Pradesh. Its first line was commissioned in year 1997 with a clinker production capacity of 6000 tpd. It was increased to 13200 tpd after commissioning of second line in January 2011. It presently produces 5.6 million tonnes of cement per annum. The capacity expansion has established the Division's brand in new markets and to a larger consumer base. A team of experienced engineers and a dedicated workforce combined with a high level of automation and sophisticated control systems have placed the Division's products in the premium segment. Prism Cement has successfully established a high brand preference among its consumers through its excellent quality products and transparent policies. Prism Cement has been certified with IMS (Integrated Management Systems) which comprises ISO 9001:2008 (Quality management systems), ISO 14001:2004 (Environmental Management Systems), OHSAS 18001:2007 (Occupational Health & Safety Management Systems), SA 8000:2008 (Social Accountability) & ISO 50001:2011 (Energy Management System) by world renowned certification body i.e. Bureau Veritas (France). Its Packing Plant at Allahabad has also been certified with IMS (ISO 9001:2008, ISO 14001:2004, OHSAS 18001:2007 & ISO 50001:2011) by Bureau Veritas (France). IT & Data Centre of Division is certified with ISO 27001:2005 (Information Security Management System) on 23rd June, 2012 to ensure confidentiality, stability of business data and effectiveness of IT processes. Consequently it has become Second Cement Company in India certified for ISMS. Industrial Canteen, Dormitory, Den & Transit House are certified with ISO 22000:2005 (Food Safety Management System) on 23rd May 2013. This International standard supports system based monitoring of food & beverage materials, improve hygiene condition and housekeeping, preparation of hygienic food supported by quality services and finally improve the satisfaction level of Guest and Employees. Consequently it has become First Industrial Canteen & Guest Houses in India certified for FSMS. The Quality Control laboratory has been certified by National Accreditation Board for Testing and Calibration Laboratories (NABL) by Department of Science & Technology, Government of India which makes the laboratory highly competent & reliable for various testing for maintaining the quality of the product. Prism School (CBSE affiliated) has been accredited with NABET (National Accreditation Board for Education & Training) by Quality Council of India. This standard provides framework for the effective management and delivery of the holistic education programme aimed at overall development of the students. This is 1st School in Madhya Pradesh & Chhattisgarh and 17th School of India. The plant is located at a distance of approx. 3 kms from the State Highway No. 6 and 24 kms from the National Highway No. 7. A private Railway siding inside the plant helps in ensuring prompt bulk deliveries to our customers. Buffer go-downs have been established at strategic locations to ensure prompt delivery at the consumers' doorstep through a dedicated network of Stockists, Sales Promoters and Clearing & Forwarding Agents. For providing an effective and customer responsive marketing facility, a Central Marketing Office has been setup at Varanasi and it is supported by Regional Offices at Satna, Jabalpur, Allahabad, Varanasi, Lucknow, Bareilly, Kanpur and Patna. Area Offices and Depots have also been established at all major towns of U.P., M.P. and Bihar to efficiently serve dealers and end consumers. A professional and experienced marketing team has been placed at all operative areas equipped with fully computerized sales and accounting system to serve the most demanding needs of the customer. To ensure availability of product at each & every nook & corner of the marketing territories we have created a strong single tier network of over 3300 retailers. Transparent policies & practices of the Company generate a tremendous goodwill and create belongingness in the network.